I’m on a roll with these delicious chocolate flavored girly martinis. First I brought you the Chocolate Raspberry-tini, then the Chocolate Peanut Butter Cup Martini. 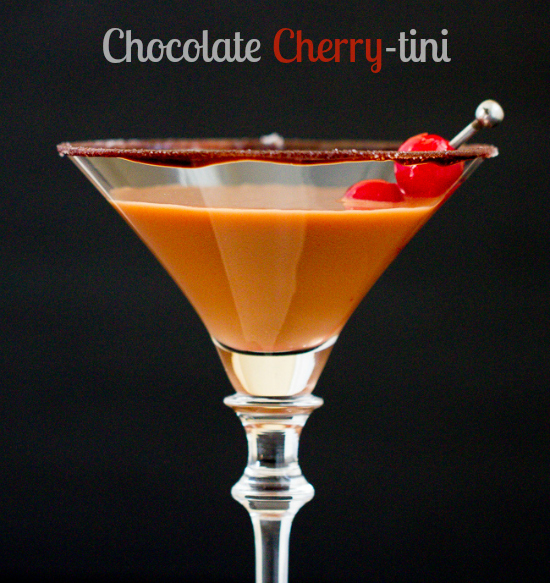 Next up on my list…the Chocolate Covered Cherry-tini. Rich and decadent, just like chocolate covered cherries. But be careful, they’re pretty potent! For this martini I used Three Olives cherry flavored vodka but you can use any cherry flavored vodka you prefer. I also used dark Creme de Cacao because that’s what I had, but I’m sure if you have white Creme de Cacao leftover from making the oh so yummy Chocolate Raspberry-tini that would be just fine too. Some cream, a little cherry juice from the maraschino cherry jar and a squirt of chocolate syrup rounded out the chocolate/cherry flavor combination for one super delicious Chocolate Covered Cherry-tini! Dip a martini glass in some chocolate syrup, then sugar to rim the glass, if desired. Combine vodka, cream de cacao, cream, cherry juice and chocolate syrup in cocktail shaker filled with ice. Shake well and strain into prepared martini glass. Enjoy!